The Mahaiwe Performing Arts Center in Great Barrington. 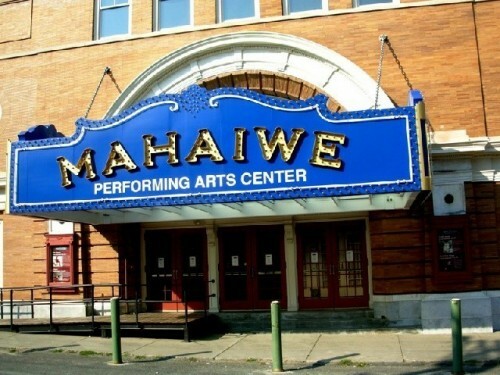 Mahaiwe Performing Arts Center announces summer 2012 programming. Highlights include comedic evenings with the Sing-a-Long-a Sound of Music (July 14) and Freddie Roman's Friars Club Comedy Festival (July 15), performances by legendary modern dance troupes MOMIX (July 6 and 7) and Paul Taylor Dance Company (July 26, 27, and 28), musical concerts by Tony winner Faith Prince (July 21), Kennedy Center Honors recipient Barbara Cook and Grammy nominee John Pizzarelli (August 4), and by Grammy Award winners Judy Collins and Jimmy Webb (August 26). "This summer, we're presenting unique combinations of popular performers with the goal of creating extra special and memorable events," said Jolly. "For example, Barbara Cook and John Pizzarelli are very excited that we asked them to perform together as they're friends, but they don't often share a stage." Julie Andrews's classic film musical takes a giddy turn with the Sing-a-Long-a Sound of Music on Saturday, July 14 at 7:00pm. Started in the UK in 1999, the show has become a worldwide hit, playing to packed houses in over 10,000 performances in nine different countries. The movie is projected in glorious, full-screen Technicolor, complete with subtitles so that the whole audience can sing along. The fun-filled show starts with a vocal warm-up led by the evening's host, who also takes the audience through their complimentary "magic moments pack," containing various props to be used at strategic points throughout the film. There is also a fancy-dress competition in which everyone who has come in costume is invited onto the stage to show off their creativity. Tickets are $15 to $25. Sing-a-Long-a Sound of Music is sponsored by Greylock Federal Credit Union. Two years ago, stand-up comedian Freddie Roman's Catskills on Broadway had Berkshire audience members in stitches. The "King of One Liners" returns to the Mahaiwe on Sunday, July 15 at 7:00pm with Freddie Roman's Friars Club Comedy Festival, featuring a combination of today's freshest, on-the-rise stand-up comics, including Cory Kahane, Tom Cotter, and Michele Balan. Mr. Roman is the longtime president of the Friars Club and a favorite toastmaster at the fraternity's celebrity roasts. He has headlined at many of the major resorts across the country, including Caesar's Palace in Las Vegas and Harrah's in Atlantic City. Cory Kahane has appeared on The Late Show with David Letterman, The Bonnie Hunt Show, The Joy Behar Show, and The Late Late Show with Craig Ferguson; her off-Broadway hit The J.A.P. Show ran for six months in New York City and continues to tour the country under a new name, The Princesses of Comedy. Tom Cotter recently filmed his own half-hour special on Comedy Central and he won the grand prize at the Boston Comedy Festival; he's also been featured on The Tonight Show with Jay Leno, The Late Late Show, and was voted Best Stand-Up at the Las Vegas Comedy Festival. Michele Balan was one of the finalists on NBC's Last Comic Standing and she has appeared on The Joy Behar Show, Byron Allen's Comics Unleashed, and the OUTlaugh festival on MTV's LOGO; she headlines all over the country at comedy clubs, corporate events, JCC's, country clubs, and cruises. Tickets are $35 to $67. The Mahaiwe presents MOMIX Botanica on Friday, July 6 and Saturday, July 7 at 8:00pm. Innovative dance company MOMIX seemingly defies categorization as easily as its dancer-illusionists defy gravity. Director Moses Pendleton's new work Botanica is an evening-length journey through the seasons, blending movement, circus, athleticism, and magical effects. Its eclectic score ranging from birdsong to Vivaldi reveals nature's changing imagery. Creatures real and mythical materialize thanks to dazzling projections, strobes, wind machines, larger-than-life puppets designed by Michael Curry, the Tony Award-winning designer of The Lion King, and-most of all-the company's impossibly nimble performers. In addition to stage performances worldwide, MOMIX has worked in film and television, recently appearing in a Target ad that premiered during the airing of the 67th Annual Golden Globe Awards. Tickets are $22 to $72. Broadway veteran Faith Prince will grace the Mahaiwe stage on Saturday, July 21 at 8:00pm. In her latest show, Total Faith, she reflects on her hilarious Southern Belle past as well as her present and future adventures. The concert will feature the songs of some of America's greatest composers, including Harold Arlen, Menken and Ashman, Stephen Sondheim, Kander and Ebb, Rodgers and Hart, and Jerry Herman.Prince has been dazzling Broadway audiences since she won the Tony, Drama Desk, and Outer Critics Circle Awards for her performance as Ms. Adelaide in the critically-acclaimed revival of Guys and Dolls. Other Broadway credits include A Catered Affair, The Little Mermaid, Bells Are Ringing, Nick & Nora, Jerome Robbins' Broadway, Little Me, The Dead, and Noises Off. She also starred in the world premiere of Terrence McNally's Unusual Acts of Devotion and in the national tour of the Broadway hit Billy Elliot. On television, Prince appears on Lifetime's hit series Drop Dead Diva. She is also known to television audiences as the lovable but quirky love interest of Oliver Platt in Showtime's Huff and she has made recurring appearances for five seasons on Spin City. Tickets are $35 to $55. Paul Taylor Dance Company returns to the Mahaiwe for its fifth consecutive summer on Thursday, July 26 and Friday, July 27 at 8:00pm and Saturday, July 28 at 3:00pm and 8:00pm. The renowned modern dance company will perform the New England premieres of Mr. Taylor's The Uncommitted and Gossamer Gallants, as well his landmark dance, Aureole, as part of the dance's 50th anniversary. Outside of New York City, no other community has had such wonderful access to the depth and range of Mr. Taylor's dances. Taylor Executive Director John Tomlinson said, "Our performances at the Mahaiwe have become one of the most anticipated events of our year." Gossamer Gallants uses movement inspired by insects, and offers a comedic view of mating rituals, in which the female of the species is often the stronger, predatory partner. The Uncommitted is a comment on the impermanence of many relationships in the 21st century; the dance looks at individuals who fail to create meaningful, lasting connections with other people. Aureole is a lyrical, light-hearted dance, with a title that refers to a brightness around a person's head; it contains romance and a brilliant male solo emphasizing the performer's virile grace. Other dances to be performed during the engagement include Esplanade, Mercuric Tidings, Syzygy, and Troilus and Cressida (reduced). See the calendar section below for the specific dances to be performed at each performance. Tickets are $22 to $67. Two legends of the Great American Songbook, Barbara Cook and John Pizzarelli, come together on the Mahaiwe stage on Saturday, August 4 at 8:00pm. Barbara Cook's silvery soprano, purity of tone, and warm presence have delighted audiences for more than 50 years. Considered "Broadway's favorite ingénue" during the heyday of the Broadway musical, she went on to launch a second career as a concert and recording artist, playing on the biggest stages around the globe. Her ever-growing mantle of honors includes Tony, Grammy, Drama Desk, and New York Drama Critics Circle Awards, a citation as a Living New York Landmark, induction into the Theatre Hall of Fame, and recent Kennedy Center Honors. John Pizzarelli is a Grammy Award nominated jazz guitarist and singer. He has established himself as one of the prime interpreters of the Great American Songbook and beyond, bringing to his work the cool jazz flavor of his guitar playing and singing. He is both a bandleader and solo performer, and has been a special guest on recordings for artists such as James Taylor, Natalie Cole, Kristin Chenoweth, Donna Summer, Roberta Flack, Rosemary Clooney, and his father, Bucky Pizzarelli. Tickets are $70 to $102. WAMC Northeast Public Radio is the media sponsor for this event. The Mahaiwe will present folk music pioneer Judy Collins with hit songwriter Jimmy Webb on Sunday, August 26 at 7:00pm. Known for her blend of interpretative folksongs and contemporary themes, Judy Collins's impressive career has spanned more than 50 years. She interpreted the songs of fellow artists-particularly the social poets of the 1960s such as Bob Dylan, Phil Ochs, and Tom Paxton-and she was instrumental in bringing other singer-songwriters to a wider audience, including poet/musician Leonard Cohen and musicians Joni Mitchell and Randy Newman. She is also noted for her rendition of Joni Mitchell's "Both Sides Now" on her 1967 album, Wildflowers, which has since been entered into the Grammy Hall of Fame, and for "Send in the Clowns," which won "Song of the Year" at the 1975 Grammy Awards. Jimmy Webb is best known for the classic songs he wrote for Glen Campbell ("By The Time I Get To Phoenix," "Wichita Lineman," "Galveston"), Richard Harris ("MacArthur Park," "Didn't We"), and the Fifth Dimension ("Up, Up and Away"), as well as "The Highwayman" forWaylon Jennings, Willie Nelson, Johnny Cash, and Kris Kristofferson. His songs continue to grace a multitude of major recording artists' albums-from Tony Bennett and Rosemary Clooney, to Urge Overkill, Reba McEntire, and Shawn Colvin. Tickets are $45 to $70 and will go on sale in late April. The Mahaiwe will host a wide variety of community events this summer, including Berkshire Cabaret presenting Stephanie Blythe, Berkshire International Film Festival, Berkshire Playwrights Lab, Chesterwood presenting Annie Leibovitz, Sterling and Francine Clark Art Institute, Close Encounters With Music, C.S.T.A., Inc. and Kutsher's Sports Academy presenting Bobby Collins, Fairview Hospital presenting Paula Poundstone, Heather Fisch,Macedonia Baptist Church, and Noche Flamenca. Details on these events follow in the calendar summary below. Located in downtown Great Barrington, Massachusetts, the Mahaiwe Performing Arts Center is the year-round presenter of world-class music, dance, theater, classic films, "Live in HD" broadcasts, and arts education programs for the southern Berkshires and neighboring regions. The intimate jewel box of a theater opened in 1905 and has been in continuous operation for over 100 years. In 2005, the theater experienced a renaissance as a beautifully restored 681-seat venue to offer a broad range of cultural and community events. Today's "Mahaiwe Mix" of diverse, high quality programming strives to provide meaningful, memorable entertainment for all ages and interests. Moses Pendleton's new work, Botanica, is a multi-media journey through the seasons. The classic Julie Andrews film musical in glorious, full-screen Technicolor, complete with subtitles so that the whole audience can sing along. Fancy dress is highly recommended. Featuring stand-up comedians Cory Kahane, Tom Cotter, and Michele Balan and hosted by Freddie Roman, longtime president of the Friars Club. Tony Award winner Faith Prince dazzles audiences with her latest Broadway show reflecting her hilarious adventures through the songs of some of America's greatest composers. The Company returns to the Mahaiwe for its fifth consecutive summer with two New England premieres: The Uncommitted and Gossamer Gallants, as well as to perform Mr. Taylor's landmark dance, Aureole, as part of the dance's 50th anniversary. Two Great American Songbook legends come together on the Mahaiwe stage.